In Congo's Long-Running War, Rebels Call Off Insurgency : Parallels Congo's war has claimed millions of lives over the past two decades. The army recently inflicted several defeats on M23, the most active rebel group, which now says it will lay down its arms. The development offers hope, but no guarantees, that calm could be restored. 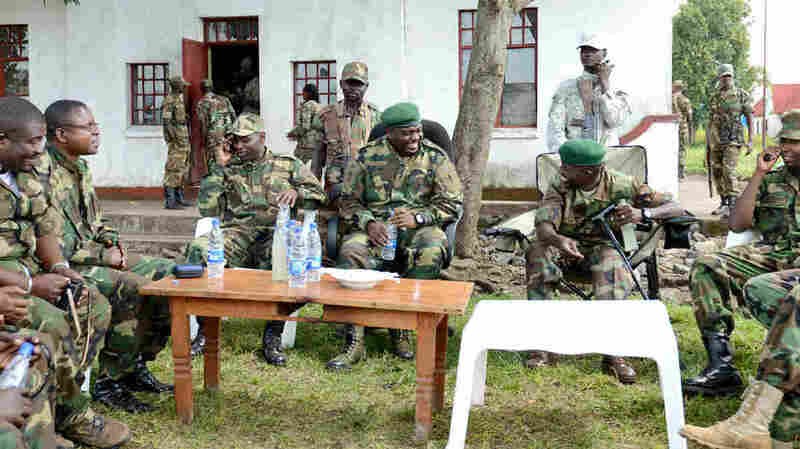 Leaders of the M23 rebel group gather near the eastern city of Goma, Democratic Republic of Congo, in June. The group, which recently suffered several military defeats, announced Tuesday it was calling off its nearly 2-year-old rebellion. There's rare good news from the Democratic Republic of Congo, a country that has hosted one of the world's deadliest and longest-running wars. M23, the most active rebel group in the country, said it was laying down its weapons and ending a nearly 2-year-old rebellion that had wrecked havoc on the eastern part of Congo. While this should help calm part of the turbulent country, it's not exactly cause for celebration. 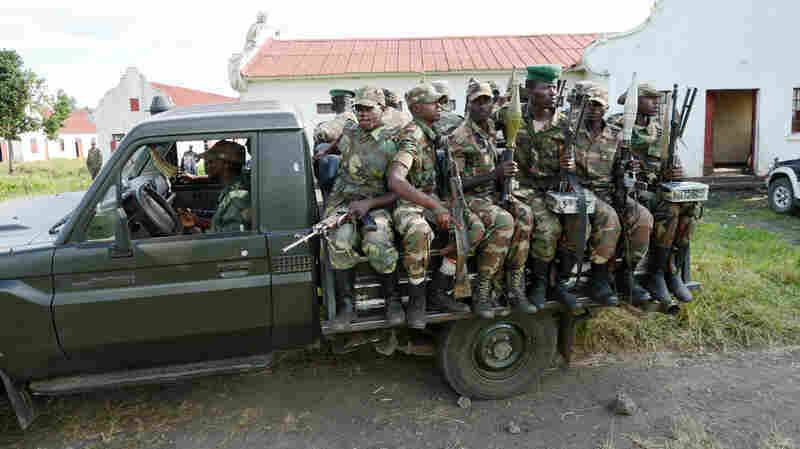 Other armed opposition factions still roam eastern Congo, the economy is in tatters, President Joseph Kabila's government is widely regarded as corrupt and the army remains relatively weak. M23 rebels sit on the back of a truck at a military camp in eastern Congo. Many of the rebel fighters had defected from the army. Still, Congo's military, operating with support from the United Nations, has inflicted a number of battlefield defeats to M23, a group that just a year ago captured Goma, a major city on Congo's eastern frontier, just across from Rwanda. An M23 leader, Bertrand Bisimwa, said in a statement that the group would "put an end to its rebellion and pursue by purely political means the search for solutions to the root causes which led to its creation." "Commanders are requested to prepare the troops for the process of disarmament, demobilization and social reintegration whose terms are to be agreed with the Congolese government," the statement added. The U.N. forces received an unusually strong mandate and that appears to have helped Congo's army in suppressing the rebels. "This summer troops from the United Nations and African Union arrived. But not merely as peacekeepers but as 'peace enforcers' with a unique U.N. mandate to 'engage and neutralize' rebel groups. With those tanks and helicopters behind them, the Congolese army routed M23 positions." Congo's war has been grinding on in various forms since the mid-1990s, with a long list of rebel factions and foreign armies fueling battles that have left millions dead, according to groups monitoring the conflict. Millions more have been driven from their homes and much of the sprawling country has been ungoverned. In the latest round of fighting, Rwanda was accused of supporting the M23 rebels. The United States responded by suspending military aid to Rwanda, one of several moves that apparently persuaded Rwanda to halt its assistance to the rebels. "The international pressure on Rwanda seems to have made a difference," Ida Sawyer, senior researcher with Human Rights Watch, told The New York Times. "They will hopefully think twice before backing yet another abusive rebellion." Even if the fighting ends, Congo faces daunting challenges. The country has extensive mineral wealth, but international mining companies generally have been reluctant to make major investments in such an unstable environment.